Cake decorating – best left to the experts? Well why should it be? If you’ve made a beautiful cake, or tray of muffins, then artful decoration provides the perfect finishing touch. This Masterclass is a suggested topic for your Cookery Group. Ask one or two members to take responsibility for arranging and leading the session, then try your hand at some techniques. You might find they’re easier than you expected! Icing bags. If you don’t have the budget for proper sets (which often come with different shaped nozzles for fancy effects), just use sandwich bags with their corners snipped off. Cake boards – for practising on, rather than real cakes. Wait until your confidence grows for that! Craft knife – for etching detail on leaves and flowers, or cutting small shapes in icing, you may need a craft or scribe knife. To begin, a fine, sharp knife will suffice. 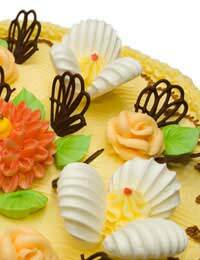 Icing scrapers – these look like plaster scrapers, with one smooth side and one ridged side, and they’re perfect for giving butter icing a professional finish. Icing colours – either paste or liquid (which is a bit harder to add). Both are now available in an amazing array of colours, so don’t stick to pink and green: be imaginative. Also – cocktail sticks, scissors, greaseproof paper and brushes will come in handy. Making Marzipan: You’ll be surprised how easy this is, and how good the results are! If you don’t like almond flavouring, try making vanilla or even rose flavoured marzipan. Natural ground almonds have an unobtrusive flavour that works well as a background to either. Marzipan is only made from three ingredients – egg, icing sugar, and almonds. Sugar Roses: It’s a daunting prospect but after a few tries and some laughs, you may find you have an expert in your midst! You can download diagrams from the internet, which show you how to roll and shape your own roses from sugar paste. They will need to dry for around 24 hours before they’re solid and ready for use. Chocolate shapes: There are two ways to make your own chocolate decorations. The first is by spreading a thin layer of melted chocolate on a sheet of greaseproof paper, and cutting out shapes when it’s almost set. The second is by piping patterns and shapes onto paper – it takes a steady hand and a bit of practice. Applying gold leaf: Master this, and you’ll be able to finish almost any cake with a really glamorous-looking decoration! You can buy gold leaf from sugar craft shops (and it doesn’t actually cost a fortune). You could also experiment with metallic lustre or shimmer powders. Crystallised flowers: These are rewarding to make. All you have to do is clean and dry the subject (choosing edible flowers like pansies, violets and nasturtiums), then brush carefully with beaten egg white, and drench in fine caster sugar. Shake, and dry overnight (or take home to dry). You’ll find Jane Asher Sugarcraft is a good source of icing and decorative products. As for books, try Jane Asher or Wendy Dufall (Book of Cake Decorating) for techniques and imaginative ideas. There are also specialist books available on Sugarcraft Flowers. Why not check at your local library, or ask them to order in some books for your group?